We’ve made importing your data a snap! You can import from lots of sources—Outlook, Google, and LinkedIn, to name a few. Plus, Top Producer® CRM plays well with over 140+ lead sources. Sync with Google or Outlook. Use the import tool to import from other programs. ...and even import from your smartphone! Open Top Producer® > click the “+” icon in the upper right corner > then select the contact icon. Log in to Top Producer® and go to Contacts > Add Contact. Enter their name and any other contact details you have, then click save. That’s all there is to it! Chances are, you’ve got leads coming in from multiple sources...like your personal website, 3rd party sites like realtor.com® and Zillow, and many more. 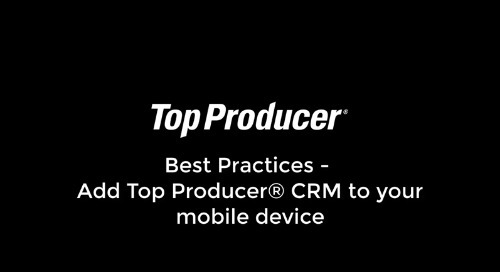 Log in to Top Producer® CRM. Click your name in the upper right corner > Settings > Contacts. Here, you’ll find your unique lead notification email address. Copy this email address and add it as the lead notification email for sites like realtor.com®, Zillow, or any of your other lead providing websites. This is a one-time setup. Once you do this, anytime a lead inquires about a listing on one of these sites, a new contact will automatically be created in Top Producer® CRM. Not sure if we support your lead provider? Odds are...we do! Click here to check out our list of over 140 providers. If you’re using Google or Office 365, we’ve made it super easy to sync your contacts. Once you set it up, changes you make to contacts in one program will be automatically synced to the other. Cool, right? From the menu in the top right, click Settings > then click the Integrations tab. Select Google (Gmail or Google Apps) > then click Sign in to Google to allow access to your account. Then, in the Contact Sync Options section, select Yes > then select the 3 options below (if you always want to sync new leads and contacts). Important note: If you want to sync your contacts that are already in Top Producer CRM, you have to set them to sync. Don’t worry—it’s easy. Just go to Contacts > Contacts Summary > select the contacts you want to sync > then click Sync > Add to Sync. Select Office 365 (Outlook) > then click Sign in to Office 365 to allow access to your account. Then click Pull Contacts Now to send all of your Office 365 contacts to Top Producer CRM. You’ll be able to see the progress in the top right and, when it’s all said and done, your contacts will sync automatically! You can import .CSV and .VCF files. Before you groan, know that we’ve made this as painless as possible for you. Again, if you need help just give us a ring and we’ll take care of it for you. Click Contacts > Import Contacts. Next choose the file to Import (either .CSV or .VCF). Then select the pipeline stage and contact type. If you are part of a team you may also choose who to assign the contacts to. Match your data fields in your file to Top Producer® CRM. Here's how to export contacts from your smartphone and LinkedIn so you can easily import them into Top Producer CRM! LinkedIn: Go to https://www.linkedin.com/people/export-settings > select the file type you want to export (.CSV or .VCF) > then follow the on-screen prompts. Smartphone: How you do this depends on the device you’re using, what your device is running and other (slightly boring) factors. We found these steps for iPhone and these for Android (scroll down a little to see the steps). Remember we can always walk you through it 1:1. Once your contacts are in Top Producer CRM, you’ll want to make sure you track their progress throughout the sales cycle. That way you’ll always have an accurate view of your Sales Pipeline. Doing this is as simple as assigning a status that reflects the stage they’re in. We give you 7 to choose from and various areas where you can update it, including the Sales Pipeline on the home page (shown below), the contact record and in the Follow-up Coach. 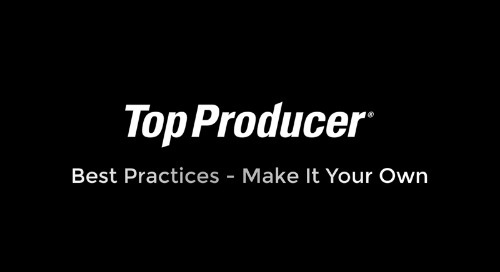 Learn how to easily log in to Top Producer and add your contact info, website, agent photo, and more. Plus, connect your MLS and other Top Producer solutions to supercharge your business. Learn how to easily access Top Producer CRM on your phone so you can always have your sales pipeline in the palm of your hand. 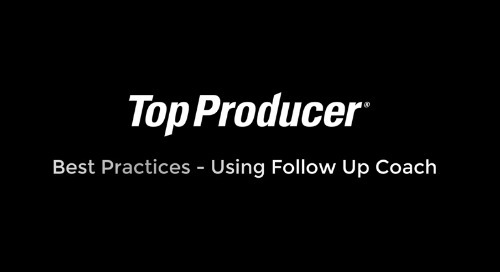 Learn how to use Follow-Up Coach from Top Producer® CRM on your mobile device or desktop so you can follow up with 5 clients a day, in 15 minutes or less, no matter where you are.